In recent times, however, we witness the same proxies developing their own tendency toward expansionist policies – in pursuit of their own mini-empires. Client regimes with local or regional ambitions now present Washington with new points of contention. At a time when the US empire has been forced to retrench or retreat in the face of its prolonged losses, a whole new set of conflicts have emerged. The post-imperial war zones are the new focus. Often, imperial client regimes take the initiative in confronting their regional adversaries. In other cases, competing proxies will brush aside their US ‘mentors’ and advance their own territorial ambitions. The break-up of the US-dominated empire, far from ending wars and conflicts, will almost certainly lead to many local wars under the pretext of ‘self-determination’, or ‘self-defense’ or protecting one’s ethnic brethren – like Ankara’s sudden concern for the Turkmen in Syria. We will examine a few of the most obvious case studies. Over the past years, the Turkish regime has been in the forefront in the war to overthrow the secular nationalist Syrian government of Bashar al-Assad. The Turks acted as proxies for the US – providing military bases, supplies, training and protection, as well as the point of entry, for overseas Islamist terrorist-mercenaries acting on behalf of Washington’s imperial ambitions. As the ‘independent’ Islamist threat (ISIS) gained territory, targeting US objectives, Washington increasingly turned to its allied, mostly secular, Kurdish fighters. Washington’s Kurdish proxies took over territory from both the anti-US Islamists as well as the Syrian national government – as part of their own long-standing ethno-nationalist agenda. Turkey saw Kurdish victories in northern Syria as a rallying point for autonomous Kurdish forces within Turkey. President Erdogan intervened militarily – sending tanks, warplanes and tens of thousands of troops into Syria, launching a war of extermination against the US-proxy Syrian Kurds! The Turkish invasion has advanced, taking Syrian territory, under the phony pretext of combating ‘ISIS’. In fact, Turkey has created a wide, colonial ‘safe zone’ to control the Kurds. The Obama regime in Washington complained but was totally unwilling to intervene as the Turks drove the Kurds out of their northern Syrian home in a massive campaign of ethnic cleansing. Thus, Turkish-Kurdish-Syrian warfare has broken out and the terms, conditions and outcome are well beyond US control. The US quest for an imperial puppet regime in Syria has flopped: instead, Turkey gobbled up Syrian land, the Kurds resisted the Turks for national-self-determination instead of driving out the Islamist mercenaries and Damascus faces an additional threat to its national sovereignty. This brutal regional war, started largely by the US and Saudi Arabia, will expose the extent to which the US-Middle East Empire has shrunk. The US Empire in Asia has seen the making and unmaking of proxy states. After WWII, the US incorporated Japan, Pakistan, South Korea, Taiwan, the Philippines, Australia and New Zealand as proxy states in an effort to strangle and conquer China, North Korea and Vietnam. More recently India, Vietnam and Myanmar have joined the US in its new militarist scheme to encircle China. Central to the Obama-Clinton ‘Pivot to Asia’ is the Trans-Pacific Partnership (TPP), a singular effort to ‘unify’ Asian nations under US control in order to isolate and diminish China’s role in Asia. The original, post-WW2 proxies, South Korea, Philippines and Japan provided military bases, troops, material and logistic support. Vietnam, the newest ‘proxy-on-the-block’, welcomes Pentagon weapons aimed at China – despite the millions of Vietnamese deaths during the US war in Indochina. While most of the Asian proxies continue to pay lip service to Washington’s ‘Sinophobic agenda’, many do so on their own terms: they are reluctant to provoke China’s economic wrath through Washington’s policy of direct confrontation. During the recent ASEAN Conference in Laos (2016), nations resisted Washington’s pressure to denounce China despite the ‘international court’ ruling against Beijing’s South China Sea maritime claims. The US’ ability to influence events through its Europe-based ‘international tribunals’ seems to have waned. The US cannot implement its own transpacific economic ‘blockade’ strategy (TPP) because of both domestic and external resistance. Meanwhile, new proxy relations have emerged. The proxy-stooges in Tokyo face growing anti-proxy opposition from the Japanese people over their nation’s role as a glorified US airbase. As a result Tokyo carefully pursues its own anti-China strategy by forming deeper economic links to new or minor proxy states in Indo-China, the Philippines and Myanmar. In the course of developing its relations with these weaker proxy regimes, Japan is actually laying the ground for autonomous economic and military policies independent of the US. Notably, the Philippines under its new President Duterte, seeks to accommodate relations with China, even as its neo-colonial proxy military relations with Washington remain in place. The Western media kerfuffle over Duterte’s ‘colorful’ language and ‘human rights’ policies masks Washington’s imperial disapproval with his independent foreign policy toward China. While India grows closer ties with the US and even offers military co-operation with the Pentagon, it is signing even greater Chinese investment and trade agreements – anxious to enter the enormous China market. In other words, Washington’s Asian proxies have (1) widened their own reach, (2) defined autonomous spheres of action and (3) have downgraded US efforts to impose trade agreements. Symptomatic of the decay of US ‘proxy power’ is the ‘disinclination’ among Washington’s clients to express overt hostility to Beijing. In frustration, the Washington-New York financial mouthpieces (New York Times, Washington Post, Wall Street Journal) provide bully pulpits for the most obscure, marginal characters, including a minor Hong Kong politician, a decrepit exiled Tibetan ‘holy man’ and a gaggle of Uighur terrorists! 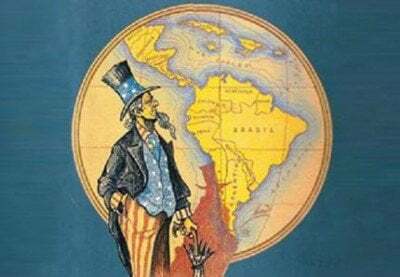 One of the most striking aspects of US empire-building is the ease with which it has secured proxies in Latin America…… and how quickly they are undermined! Over the past three decades the US propped up proxy military regimes, which were overthrown and replaced by independent governments in the last decade. These are currently being replaced by a new wave of neo-liberal proxies – a motley collection of corrupt thugs and elite clowns incapable of establishing a sustainable imperial-centered region. A proxy-based empire is a contradiction in terms. The Latin American proxies are too dependent on outside support, lacking mass internal popularity and roots. Their very neo-liberal economic and social policies are unable to stimulate the industrial development required grow the economy. The Latin American proxies are mere predators, devoid of historical entrepreneurial skills of the Japanese and the disciplined nationalist ideology of the Turks. In that sense, the Latin American proxies more closely resemble the Philippine ruling oligarchy: They preach submission and breed subversion. Proxy instability and policy shifts emerge as powerful forces to challenge the US empire – whether the Chinese in Asia or domestic internal conflicts – like the Trump phenomenon in the US. Imperial wars continue . . . but so does an upsurge in domestic instability, mass rejection of imperial policies, regional conflicts and national wars. The decline of the empire threatens to bring on an era of intra-proxy wars – multiple conflicts, which may or may not benefit the US empire. The war of the few against the many is becoming the war of the many against the many. But what are the choices in the face of such historic shifts? Only the emergence of truly class-conscious organized mass movements can offer a positive response to the coming deluge.